Connecting Country believes a healthy landscape will be in a better position to adapt to the effects of climate change than one that is under stress. A healthy landscape will also help mitigate the effects of climate change through processes such as carbon sequestration, increasing genetic diversity of indigenous species, and assisting their movements across the landscape. Connecting Country will continue to undertake efforts towards this goal through a mix of on-ground environmental works, supporting Landcare and similar land management groups, and community engagement and education. Across the long-term, we will monitor the effects of our efforts using rigorous science and community contributions. Local landholders and groups can also do much to help the local landscape adapt to, and mitigate the effects of, climate change. 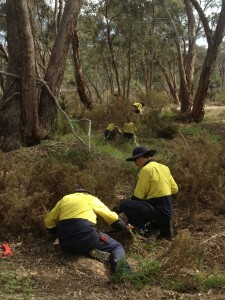 Green corps team managing threats in remnant bushland. Connecting Country increasingly consider that the best approach to landscape restoration in the face of climate change is to protect existing habitat and to facilitate natural regeneration of new habitat. The ecological benefits of natural regeneration are two-fold. First, the resilience of the site is assessed over a longer period, which is beneficial when establishing genetically diverse site-specific native vegetation. Secondly, it also protects existing stores of captured carbon within the vegetation, and continues to sequester more carbon from the atmosphere. In addition, looking after our existing bushland has been shown to be more cost effective than intensive revegetation programs. Controlling pest animals, including both grazers (rabbits, hare, deer) and predators (fox, cat). Undertaking weed control particularly in vulnerable areas such as reserve edges. Reducing threats such as overgrazing on existing remnants. Protecting waterways and riparian areas with fencing. Increase extent and connectivity of riparian and floodplain vegetation to reduce impact of extreme events. Where appropriate, promote natural regeneration in riparian and floodplain environments. For control burns, have them aligned to ‘tolerable fire regime intervals’, as determined by rigorous scientific evidence. Identify and protect ecosystems with high sensitivity to fire. Building resilience in the landscape through targeting land adjacent to bushland for the formation of habitat corridors. Connecting Country believes plants used for revegetation should continue to use locally indigenous species, but have a wider genetic diversity. As a guide, Professor Ary Hoffman has suggested that revegetation projects should include 70% of the plants from a local provenance source, 20% from a middle distance provenance and 10% from a far distance provenance. What comprises local, middle and far will vary from species to species. By having a broader genetic diversity to draw upon local plants will have a greater capacity to adapt quickly to a changing climate. There have been some suggestions that revegetation projects should include plant species that are not currently indigenous to the local area, but that are indigenous to warmer/drier areas nearby. We do not consider that there is sufficient evidence, scientific consensus or rigorous guiding documents to support such an approach at this point in time. 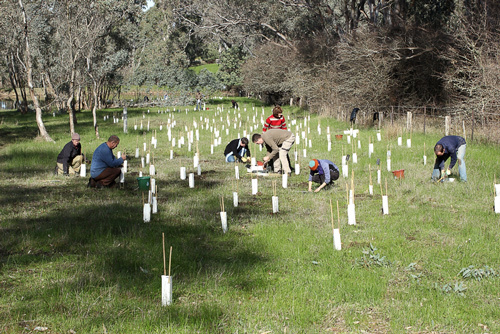 From all across the state, we are hearing reports that the effects of climate change are causing significantly reduced successes of revegetation projects. Our own revegetation projects have required more regular repeat visits for watering of young plants than has been required in past years, and also over a longer number of months each year. We therefore advocate monitoring the success of your revegetation projects. Which local species work best, and in which conditions? What time of year is best for planting? Is watering over summer a requirement? Under what circumstances are tubestock plantings, direct seeding or facilitated natural regeneration successful approaches. By collecting information on these and other similar questions, we can refine our practices for increased success. 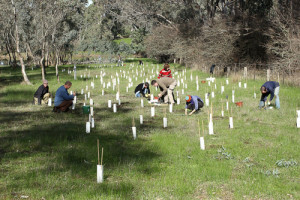 Click here for more revegetation tips and techniques. Department of Environment and Conservation (NSW). (2005).Recovering Bushland on the Cumberland Plain: Best practice guidelines for the management and restoration of bushland.